CARRYING ON: The ban on single-use bags is taking some getting used to for folks in Manchester. “DO you want to purchase a bag?” the cashier inquires. “How much for it?” the young lady asks her. As more and more customers arrive at the Shoppers’ Fair supermarket at the Manchester Shopping Centre on this warm Saturday morning, the lines at the check-out points are getting longer. 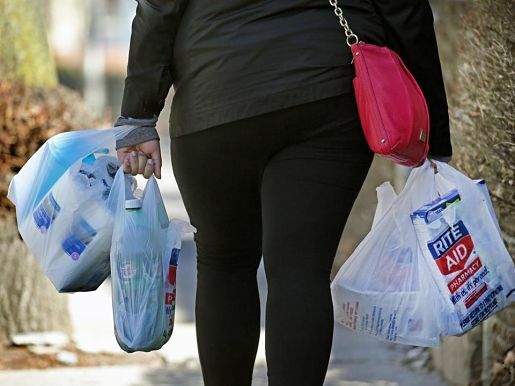 With the ban on certain single-use plastic items now in effect across Jamaica, customers here can choose to take home their groceries in free brown paper bags or via a medium-sized Progressive Shoppers shopping bag that will add $130 to their receipt. Brown paper bags aren’t sturdy enough to carry certain kinds of groceries, especially tin goods, so the $130 bags are going fast. Extra bucks for the proprietors. The ban on the (usually free) black scandal bags is still fresh so, unsurprisingly, many customers forget to leave home with their own bags to carry their groceries, etc. “They’ve been arguing a lot,” the cashier tells me when I ask about the transition and the customers’ reactions to ‘the new system.’ It hasn’t been a smooth transition, she concludes. But, by all accounts, some people are taking it in stride. After all, it’s become super-clear that there will be no reversal of this islandwide ban that the Holness-led government put into effect on January 1. New year, new rules. Manager at the Super Plus branch, Dawn Davidson, says the transition hasn’t been easy for her staff and customers. “It’s been challenging because some customers don’t remember to bring their own shopping bags. We give boxes but some of them can’t manage the boxes, and we have to have someone accompany them to the bus stop. So it’s a challenge right now,” she says. Views were similar at the action-packed Mandeville market, where one female vendor with ground provisions and tomatoes had a few black scandal bags on sale. “We sell them because we have them, but we know that them soon out,” she says. Looking on is a plump, light-skinned peddler with her arms laden with sizeable blue and red shopping bags, for $100 each.